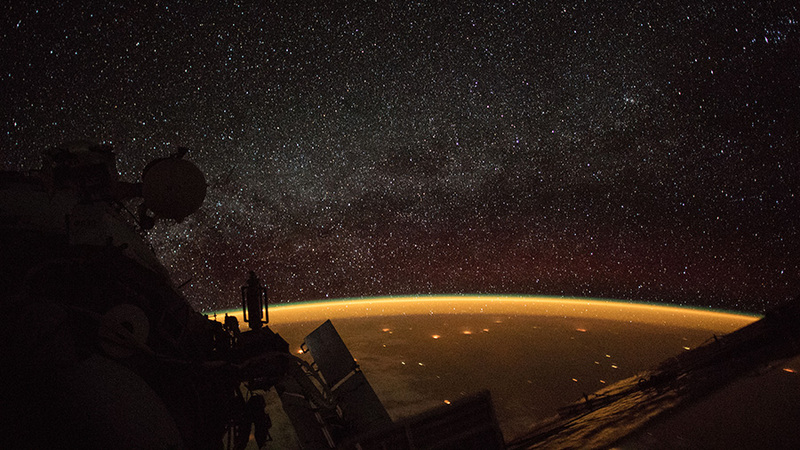 The International Space Station was orbiting about 256 miles above South Australia when a camera on board the orbital complex captured this celestial view of Earth’s atmospheric glow and the Milky Way. NASA astronaut Nick Hague is safe and sound and back in Houston after last week’s mission to the International Space Station was aborted during ascent. Meanwhile, the three orbiting Expedition 57 crew members continue ongoing research, maintenance and cargo packing. Hague returned to Houston Saturday following his emergency landing shortly after launch in the Soyuz MS-10 spacecraft in Kazakhstan on Thursday. He and fellow Soyuz crew member Alexey Ovchinin were flown back to Moscow after medical checks in Kazakhstan then returned home to their families. Back in space, two astronauts Flight Engineer Serena Auñón-Chancellor and Commander Alexander Gerst and worked on a variety of life support and science experiments today. The duo also partnered up for cargo operations inside JAXA’s (Japan Aerospace Exploration Agency) HTV-7 resupply ship. Auñón-Chancellor started her day testing the performance of battery life in space for the Zero G Battery Test experiment. Gerst was activating and checking out a life support rack to ensure good carbon dioxide and water management in the device. Cosmonaut Sergey Prokopyev worked throughout Monday on life support maintenance in the station’s Russian segment. The Russian flight engineer also ran on a treadmill in the Zvezda service module for an experiment observing how microgravity impacts exercise. Is it true that the Soyuz on station has a past due date because of the hydrogen peroxide fuel degrading? Also I read that the one on the ISS has to leave by December because of that issue. Like to know if that’s true, or just a story among many.